I have finally finished the last touches on my studio! We moved in to a lovely Arts and Crafts style home in Chico. I feel incredibly lucky to have this space. Stuart has his own creative space as well in the sun room. This is the first time in a long time that we each have our own designated creative space. 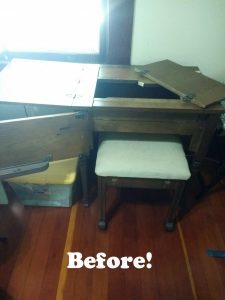 New to me is a sewing table with rolling chair that I got at the Salvation Army for $12.40. The table is great, but the rolling chair is the best!!!! I repainted this as well and gave it a new fabric cover (continuing my fabric collection theme of Carrie Blooms’s “Dreamer” line). Stuart also greased the wheels for me because they were squealing a lot. I tightened some screws, put it back together and it rides like a dream! If you don’t have a chair in your studio that has wheels, then go out right now and get one! I never thought that I would enjoy sitting. 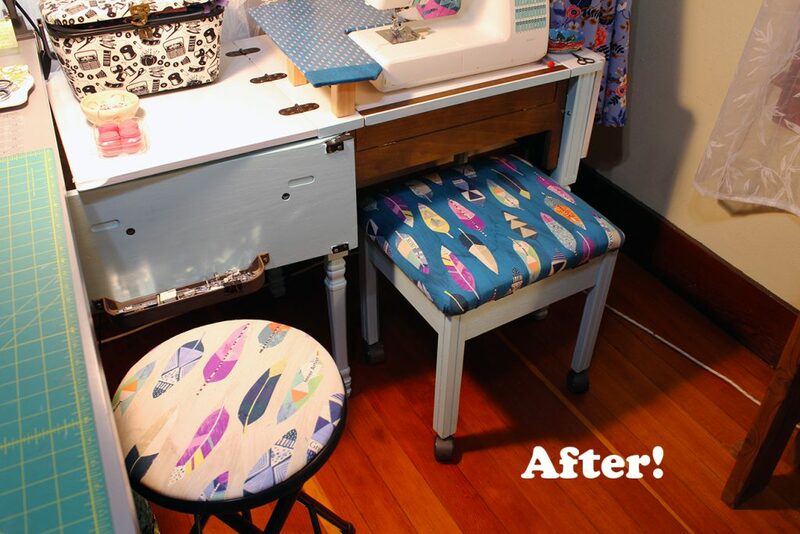 I am able to go from the sewing machine to the iron, to the cutting table in a quick roll. There is also storage with this one. I keep my drawing supplies handy here. Get one!!! 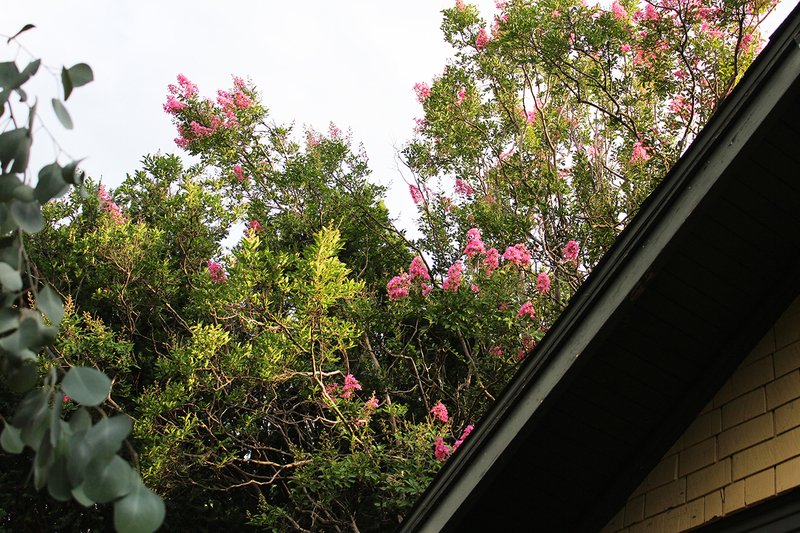 Our new house rental is on a property with a lot of great trees. 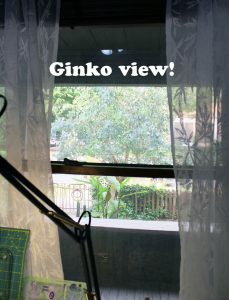 From my front window I can see a lovely Ginko Eucalyptus tree. This photo does not do it justice. From the side window I look out in to a little side yard. The door to the room has a lovely vintage style mirror. Great for when I am doing fitting adjustments! 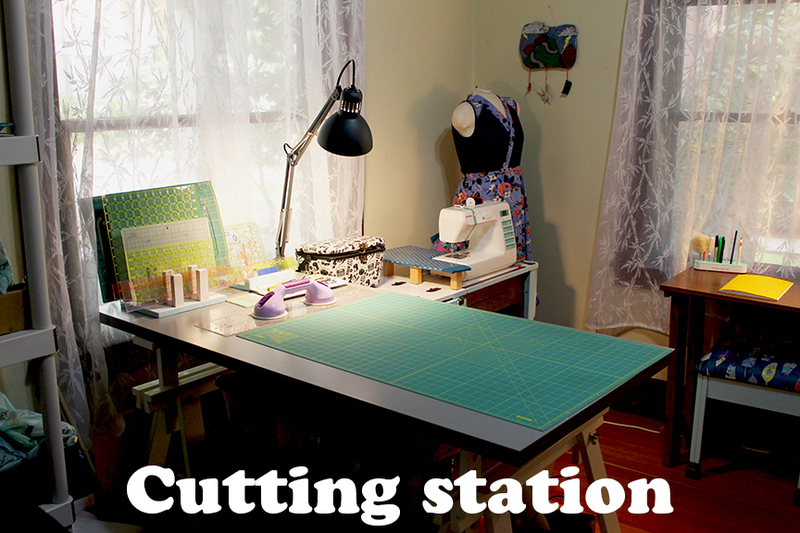 My cutting station is set up right in the middle of the space. This is rarely this clean. I thought that it would be good to take a photo before I got in to a project. My new goal is to clean up after I finish each project. This studio can get very wild and crazy if I don’t do this. My dress form has a great place in the corner of the studio. I made it using this tutorial: Plaster dress form. I created some ruler stands with some scrap wood. These make me so happy! It is great having my rulers and cutting boards at a quick reach. 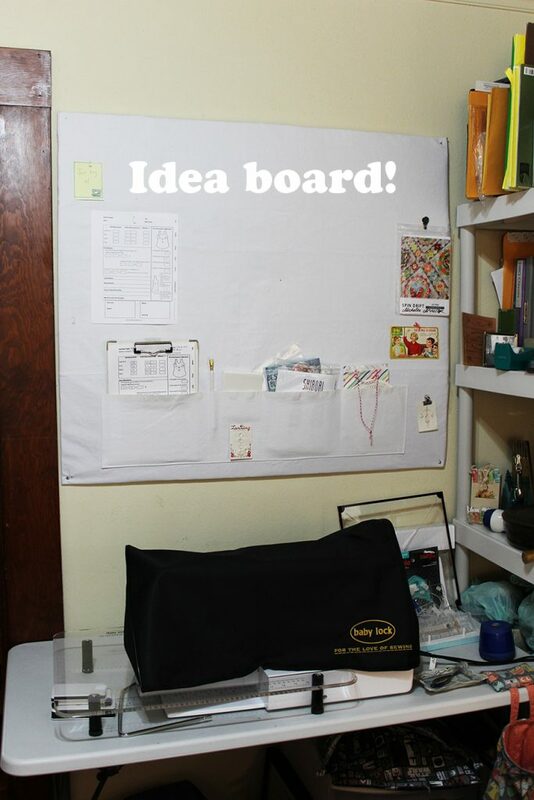 Another simple thing that is making so happy about this new space is this idea board that I created. I took some of my cardboard and taped some layers together. I then used some white canvas to create a cover. 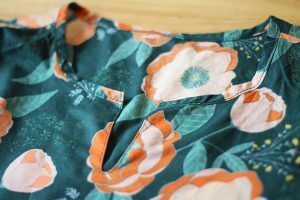 I love when there are pockets in things and created some pockets on the bottom strip. I can now put up drawings, ideas and projects up here. 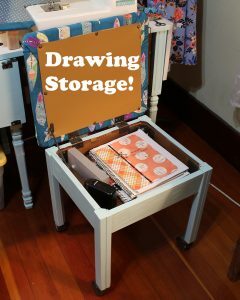 Below is my machine that I use for free motion quilting along with another ruler station. 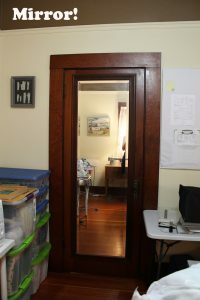 To the right I have all of my art supplies, current sewing projects and books. 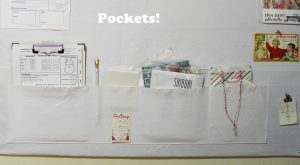 Pockets!! 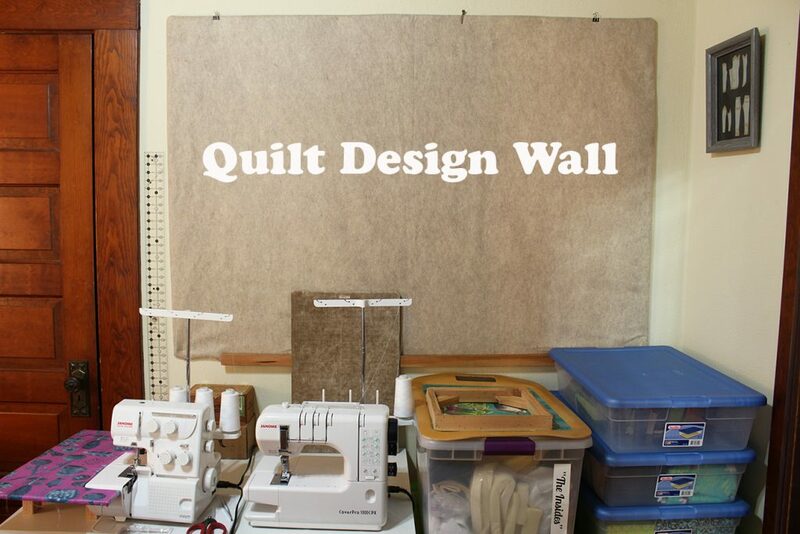 I had already made a Quilt design wall in my former studio. It is two sheets of foam core taped together with felt on top. This is where I hang up a quilt in process. 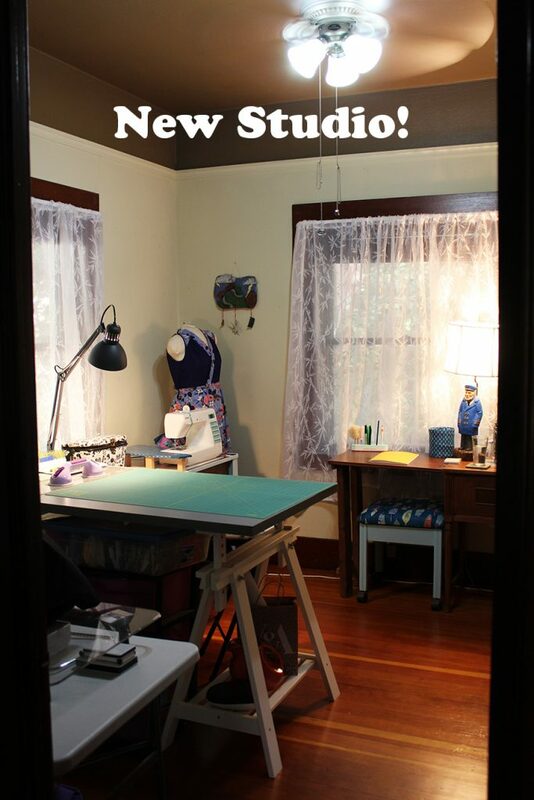 This fits right above my serger/coverstitch station. I keep all of my fabric in bins. I have to keep it organized otherwise, it will be everywhere. To the right is an art piece from a show that I had about women’s garments during WWII. 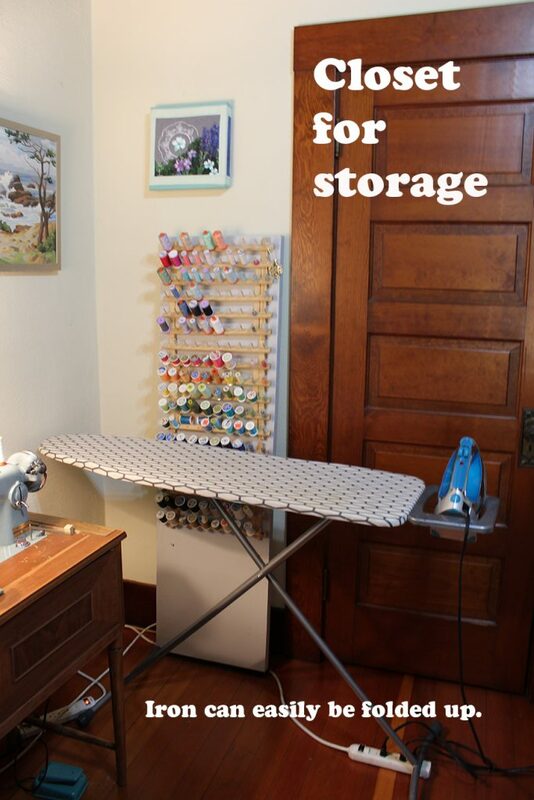 My ironing board is easily folded up if I am not using it. (I am always using it!) It is easy for me to get in to my closet if needed. 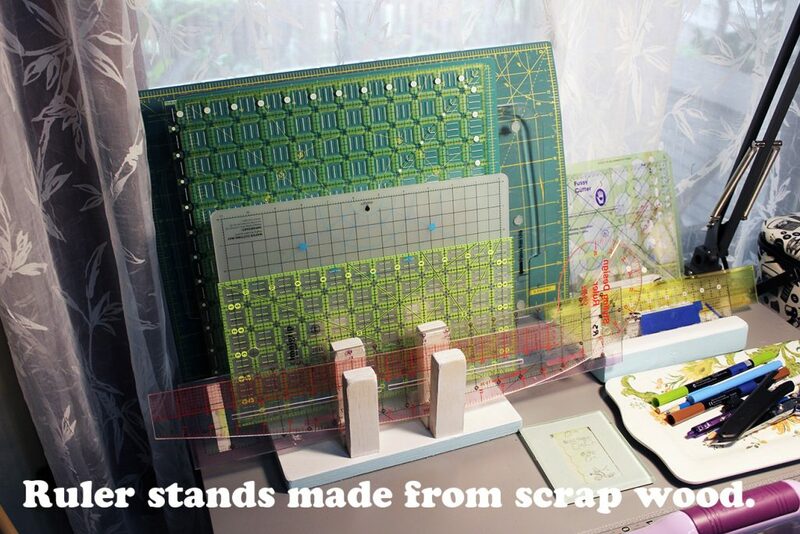 It houses more fabric, bags and jackets. It is great to have a sit down space to work at. I can sit here and write out ideas. My White sewing machine has also been fixed up. I keep it set at a basting stitch. This way when I am working on a muslin, I can sew it up quickly. The lamp was my grandmother’s. I call it the captain and he watches over the studio. The Maine in me likes to have him around. The California in me now loves the bamboo curtains. 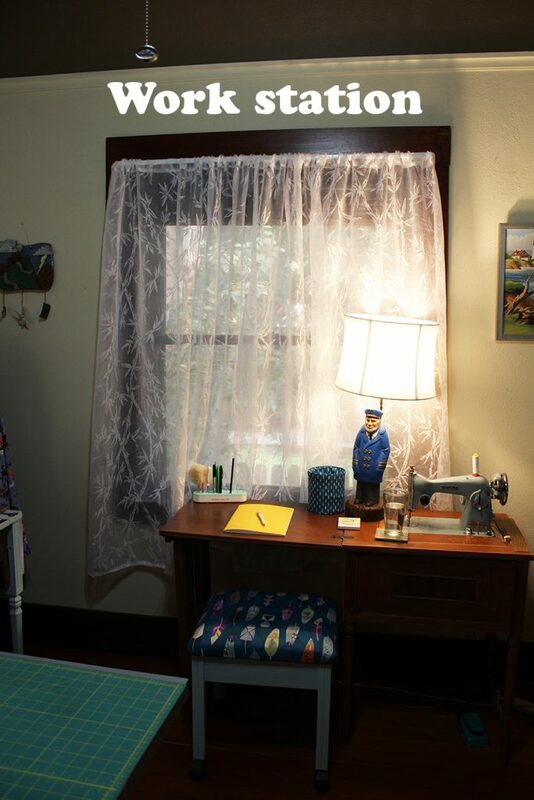 I also made some new curtains from some fabric that my Aunt Anne had sent me. These curtains really lighten up the space and give me a little bit more privacy. Each window does have wooden blinds if I want to be completely private. What will I do next? I have so many projects that I have been wanting to do. I am going to get some things started that I can work on as the semester starts. I know that this will involve garments, the Spindrift quilt pattern and a new art quilt that I will paint. Love that I have my space all set up and ready to go!! 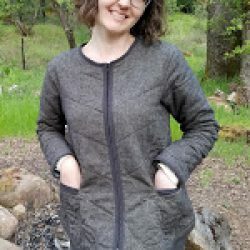 Tamarack Jacket with zipper and ruler work quilting. 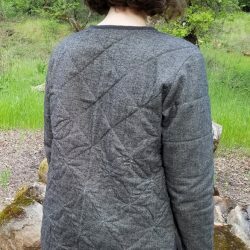 When I first saw this pattern I wasn’t sure if I would like the fit. It isn’t close fitting, yet because I paid attention to how it fit through my shoulders, I keep getting compliments on how well it does fit. 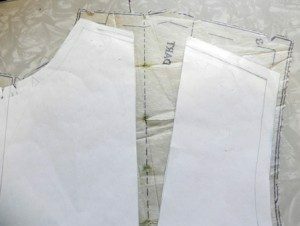 I had also been using quilting rulers with my quilts and thought that it would be a great jacket to use these on. In November I started. Below are some tips on how I created mine. I planned out what I wanted to do with my jacket. I scanned the pattern image and then printed it out. I drew different ideas out and then came up with the one that I thought would be stylish but not too much. The fabrics that I chose were a grey flannel, Quilter’s Dream Orient batting (Silk, bamboo, tencel and cotton mix) and Carolyn Friedlander Lawn. I got this from Honey Run Quilters were I work part time and teach garment fitting and construction classes. I safety pinned the lawn, batting and flannel in a sandwich. I placed the pattern pieces on this and then cut out an inch or two around each pattern. I set each aside. Practice is really important with this! I tried out different threads and different circles before deciding on my final with a practice sandwich. I drew out on the pattern some marking lines to match my quilting. I placed a horizontal and vertical line on each to match up. I first did diagonal lines using my walking foot with a gray thread. 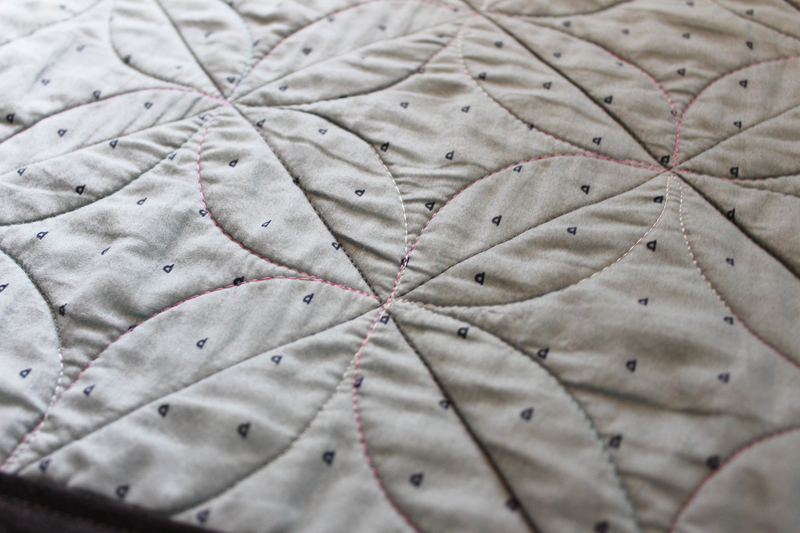 I then used my rounded quilting ruler and variegated thread for the floral designs. 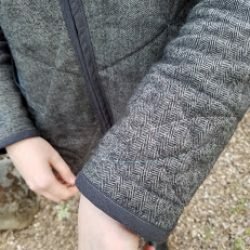 The sleeves were quilted with just a straight line across and a detail near the hand. Once I was done quilting, I placed the pattern back over and cut around each. 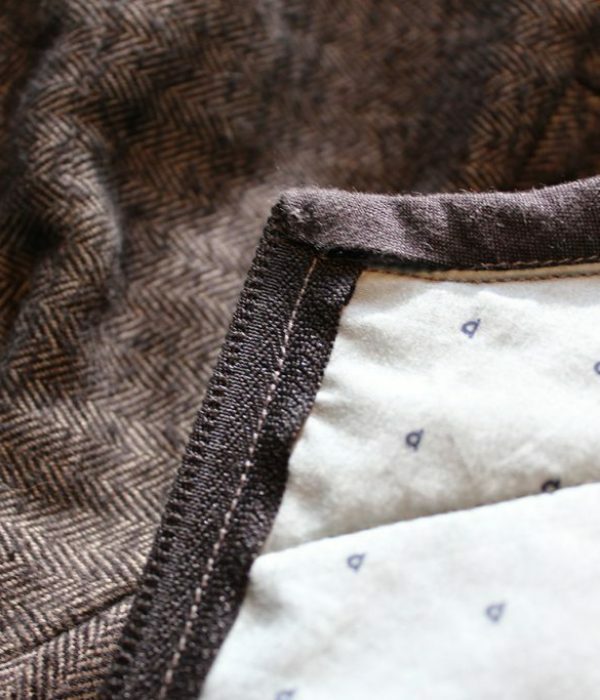 I changed the pocket direction to be angled along my quilting. I sewed together the pieces following the instructions. After sewing the seam together, I cut out as much of the bulk of the seam as I could. I left the lining whole and then serged this together. I wanted a zipper. 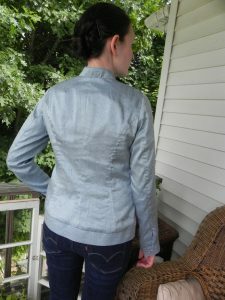 I sewed the binding to the edge of the front and then used fabric glue to baste it to the back. 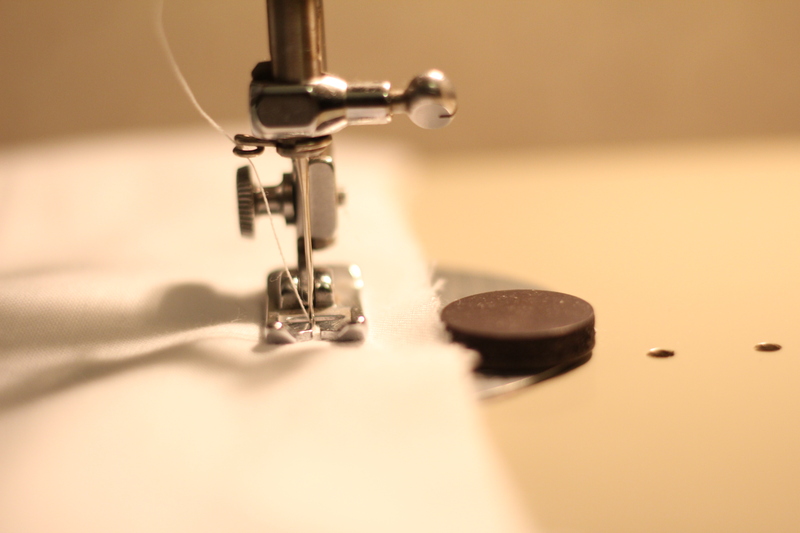 I used a stitch in the ditch foot and moved my needle over in order to add the topstitching. I did the front part (where the zipper goes) before I topstitched the rest. I then added the zipper. 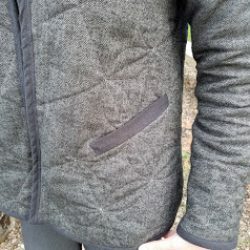 I hand basted the zipper in location before I did the machine stitching. I then finished the topstitching binding on the remaining areas. 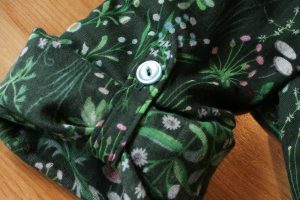 I have been working on a lot of sewing projects these days. Since I am teaching garment construction classes I have been busy in the studio altering and creating these. 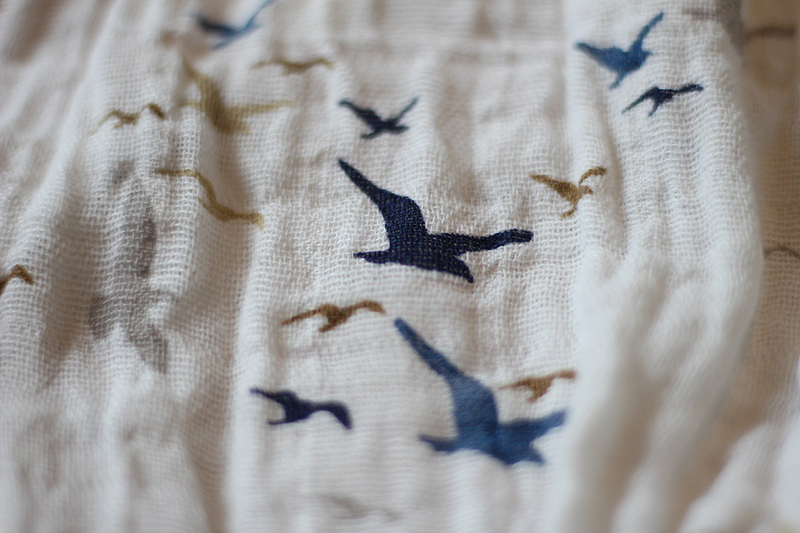 One pattern that I have created a few times is Make It Perfect’s Shearwater Kaftan. 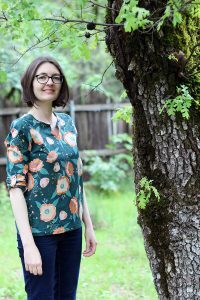 This pattern is a loose fitting top, but I wanted to fit it a little closer. I made a few alterations and I will mention these below. Many of my students created this top just fine according to their bust measurement. I just can’t help but constantly alter a pattern to better fit my specific body shape. My first version I created using Art Gallery Fabrics Sprinkled Peonies Fresh by Maureen Cracknell. 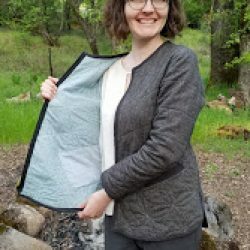 This is a great lightweight Voile. I work at Honey Run Quilters and got this fabric from the shop. Since the summers in California are going to be hot, the lightweight cotton Voile is a great fabric! Here are some photos that share my stitches and the accents to the top. For the sleeve I used a french seam. The sleeve has a little tab and it is visible from the inside. This was great, but it was really difficult to finish the bottom. I tried a few different options, but I am not entirely happy with how these turned out. I created a facing similar to the neckline piece. I kept the neckline simple. I created bias tape from the original fabric. I used the shorter of the neckline openings. I serged the top seam. I pressed open and serged each side. On the sleeve I kept the seams toghether. I only serged once. I figured that this would give less bulk. Below are photos from my second version. I used a Double Cotton Gauze for this one. 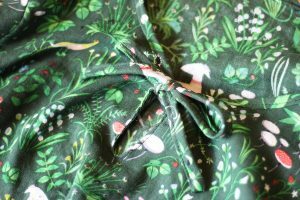 This is a textile that is Andover Fabric’s Tapestry in Green- Hit Parade by Lizzy House. I believe that this fabric is no longer available. 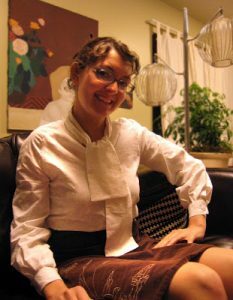 I also added a tie to the front and used the original long length. One of my tips with working with double gauze is be careful cutting too close to the stitch. When I was working on the tabs for the sleeves I cut too close to it once. The stitch fell away. 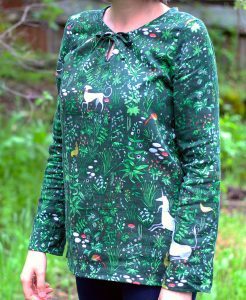 I remade it and made sure to leave at least a 1/4″ seam allowance before turning it. I will probably create this again and create a short sleeve. The double gauze is also cotton and will be great for summer tops! This year has been a whirlwind of teaching! It has been such an incredible experience. As an Adjunct Professor I have been teaching both 2D Design and Basic Drawing courses. With the drawing course, it has been an incredible seeing how my students have been developing and building their drawing abilities. My 2D Design students have recently created amazing repeating patterns that are well crafted and really show what they have learned over the semester (Shapes, placement, repetition, color, craft, etc). It has been an incredible opportunity to share my love of what art can do or be in someone’s life. When I am not in the classroom, I am usually sewing these days. 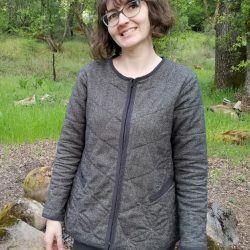 Along with teaching at California State University, Chico, I have been giving garment construction classes at a local Quilt Shop, Honey Run Quilters. These ladies have been an incredible group to work with! I love having the contrast of the younger students wanting to start their careers and women who have had these and are ready for another challenge. I also love that most of my sewing students are retired teachers and this gives a unique kinship with them. 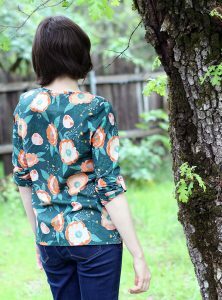 I have focused on creating garments that are made from patterns that they can sew. I am able to teach others how to construct these and give my own helpful hints. Below are some of the clothes that I have created. I will go into further posts with some helpful sewing tips. 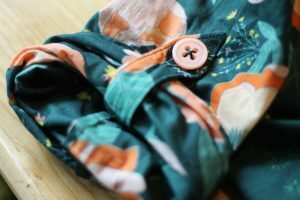 I will also start a new newsletter that is full of sewing garment tips. On my future projects I will be sharing photos of what I do as part of the fitting process. 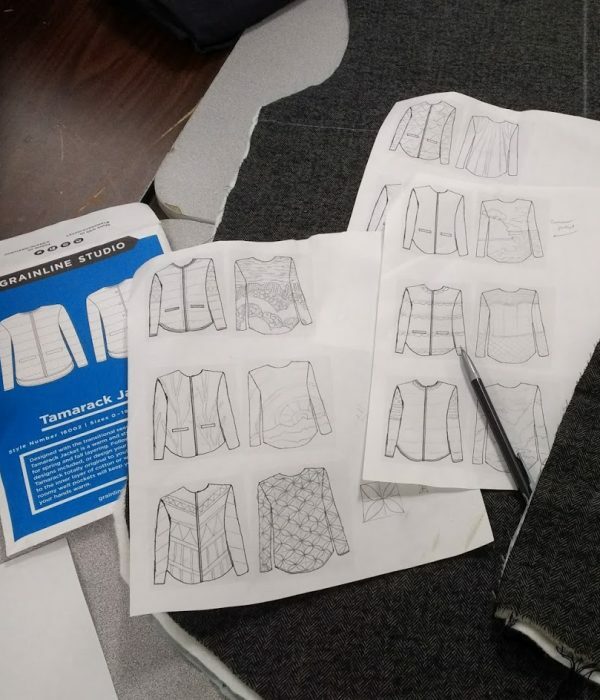 For my garment classes, I focus on cutting, measuring and adjusting your patterns to achieve the perfect fit for your specific body shapes. 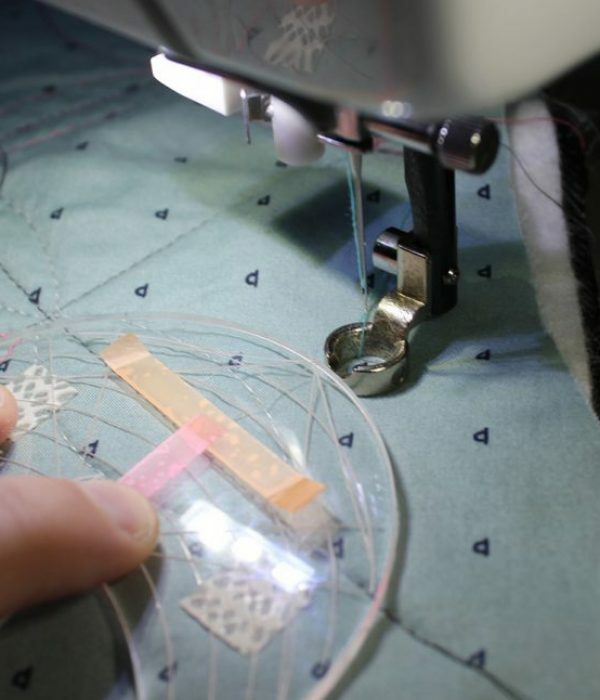 I love this part of sewing and my goal is to have my students try this out with their own projects. As an artist, it is easier for me to experiment with different ways of constructing. It doesn’t scare me to try something that the pattern doesn’t show. 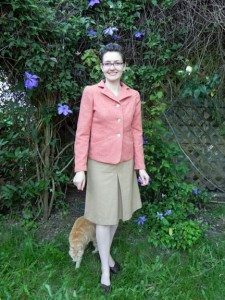 Sewing garments connects me with women through history. This act of creating has a tradition and currently I am coming up with ways of bringing this into my artistic practice. When I first followed a pattern, I did it blindly and followed the directions to a T. (Shirt shown here) The shirt pulled across my shoulders, the sleeves were too short, the back was tight against my shoulders, etc. I thought that was how you did it. 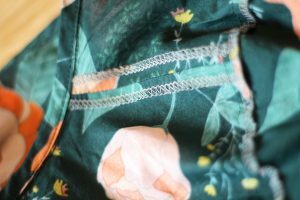 It wasn’t till I got more comfortable with the whole sewing process that I ventured out of what the pattern told me and how I could change things to make them fit perfectly. Lets say that it has taken me years to perfect and learn from each project. That is what I love about sewing though. 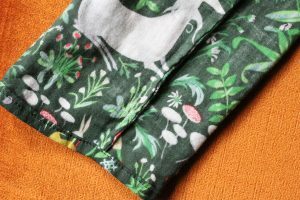 I love how you can alter a pattern to fit you and then reuse it to create another project. Alterations can be made to add a new element or style. You can change the color or print and it is really up to you! You are the one deciding what to wear. It is an incredibly liberating feeling! To also tell someone that you sewed something yourself is awesome. Also, the more times you create something, the easier and faster you get. When beginning your projects it is important to think about what you want to wear. 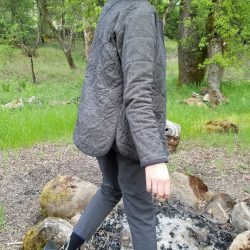 Do you want a nice jacket that you wear all of the time? 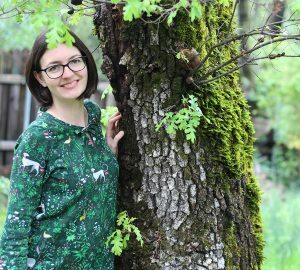 Do you want a cute dress to wear to a party? How much effort is worth the time you put into a project. 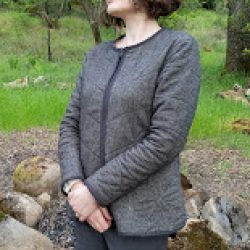 I loooove jackets and so I tend to make a lot of these. 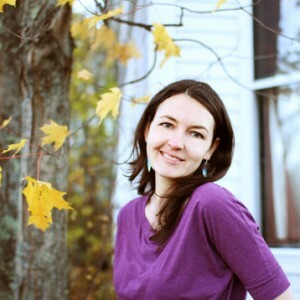 A little about my own adjustments that I make with each project. Forward Shoulder Adjustment: I slope my shoulders forward and this effects my posture. This means that my shoulders are not in a straight line but more bent. This means that a straight shoulder seam doesn’t work. I have to angle out my seam to make up for this. 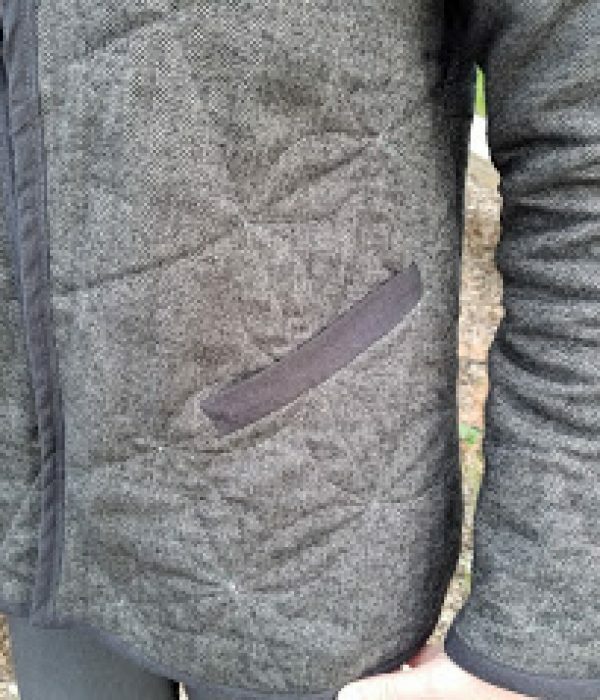 This really helps the jacket to fall properly. 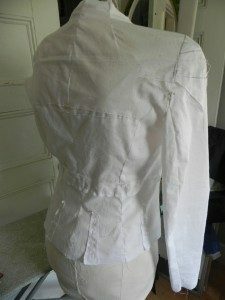 Pointy Shoulder Blades: I have protruding shoulder blades in my back and this means that shirts can pull across tightly. 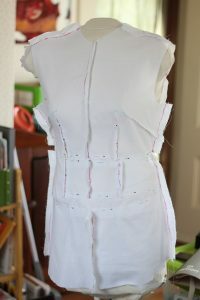 When fitting my muslin, I create a slit at this point and allow the fabric to get more ease. Sway Back: Lets just say that I have a rounded lower back and a rounded but. This means that after making the shoulder and upper back adjustments I do this. There is usually a gather of fabric that happens in my lower back. I can gather this together for the adjustment. Front: I wait to do the front till the back is finished. I then cut and alter based off of what looks like it falls best. I may make adjustments around my belly. At this point, I probably have to adjust my side seams as well. You just draw out what would be your new side seam. Sleeves: I will measure the sleeve against my own length. I sometimes may add length. I usually will change the placement of the sleeve since I adjust the seam for the shoulder. 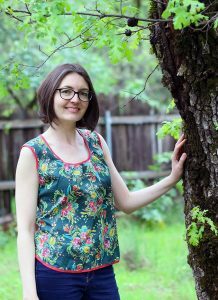 Copy Pattern that best fits chest measurement and adjust to were the pattern matches your size. 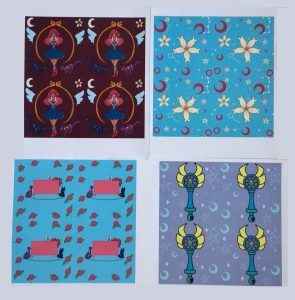 Copy the original pattern onto banner paper that can be cut up. Cut out Muslin pieces that are needed for fit (At this point I don’t cut cuffs or neckline, pockets or Facings) I just cut the basic shapes: Front, Back and sleeves. Basically I just cut what will be needed for fitting. Do Stay Stich the seam around the neckline though. This will keep the shape better. I sew together these pieces using a basting stitch. I know that now I am sewing, ripping, sewing, pinning, taping, marking, cutting, moving, etc. It can be a laborious process but worth it! If you are taking the time to make something from scratch, you will feel even more excited about it when it fits you just right! 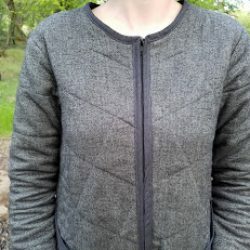 If I am sewing a jacket, I will sew the front and back together first and fit this. I will wait to add the sleeves once this is set. 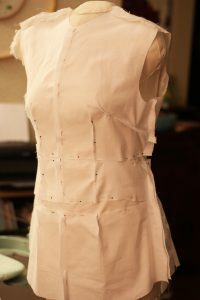 Once I get the fabric to the point of fitting (I created a dress form of my own body shape to help with this), I take out a marker. I make notes of where seams are sewn. I then take apart each seam. 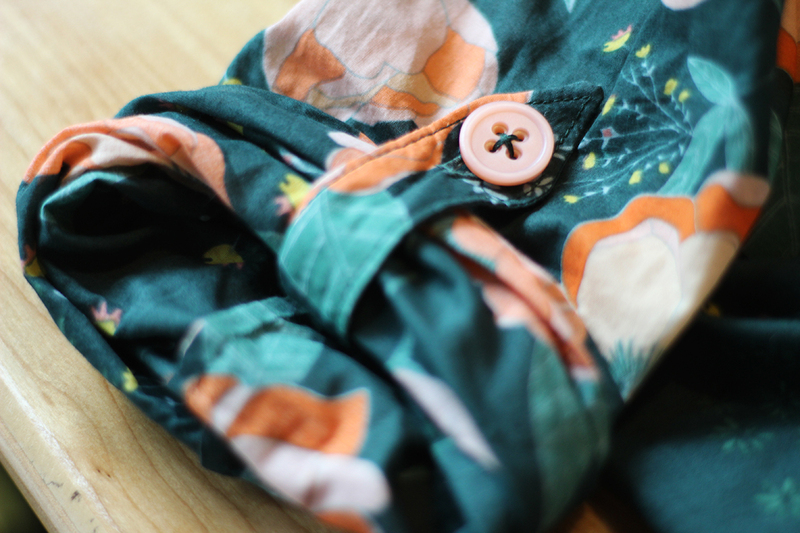 If there are a lot of pins, I will bring the section over to my sewing machine and stitch it into place. I then take each piece and iron it. this flattens it into a piece that I can use. This isn’t necessarily the way that I have learned, but over the years this has really worked for me. (So far this does not work for jeans. I am still working on getting this right!) If there are a few adjustments I just go back to the original pattern and work with that. It is best to keep things simple whenever possible. I tend to really want something to fit perfectly though and this means working it till it is just right. Now, I have the pattern. I use this to cut out my final fabric. 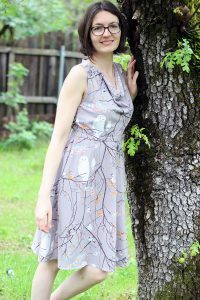 I now sew the garment in the order that the pattern says. At this point the sewing is the fastest part! Once you wear garments that fit you right, you see how nice being able to do this yourself is! Being able to adjust a fitted garment for body type is flattering and incredibly satisfying. Vogue Sewing: This is the newer version of my book. Mine is older yet has had so many helpful pages about fitting. Fit For Real People: One of my favorite books about fitting! Get this one for sure! 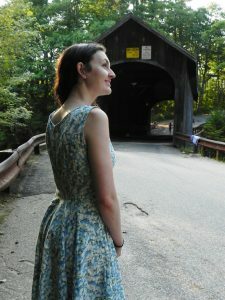 Built By Wendy Dresses: This was the first book that made me think about how I can change a pattern to fit what I wanted. 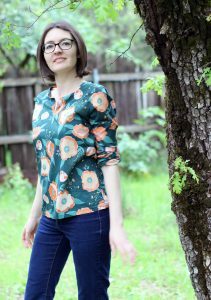 The Colette Sewing Handbook: I lived in Portland, Oregon at the time of this book being released and attended the book launch! Love her style with the patterns! 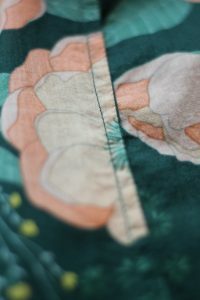 I am going to be creating some more garments and sharing my process on here. If you have any questions about my process, feel free to comment or send me an email. I love to see what other people are working on as well!